It’s fun when you can see a new production of a show you’ve seen before and feel like you’re seeing it for the very first time. I loved Buyer & Seller when I saw last year’s production by another local theatre company. This year, though, Stray Dog is presenting the quirky one-person show featuring the delightfully talented Will Bonfiglio, and it seems like a new experience. In fact, I think I like it even more this time. The story is a crazy one–a fictionalized tale of out-of-work California actor Alex More (Bonfiglio), who is hired to work as the only employee in an old fashioned shopping mall in superstar Barbra Streisand’s basement. The house is real, as is the basement mall, and Streisand’s book, My Passion For Design, that describes and pictures the real house and mall. 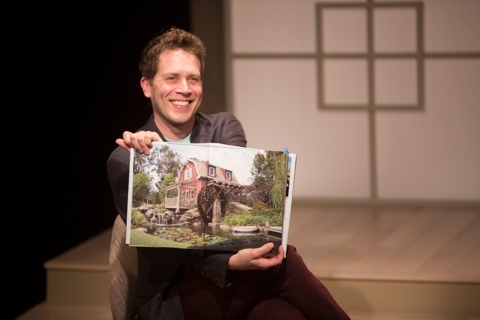 What’s not real, however, is the rest of the story, which springs from the vivid imagination of playwright Jonathan Tolins and serves as an excellent showcase for a talented actor with lots of energy, and the personable Bonfiglio is perfectly cast. With seemingly boundless reserves of bouncy, bright and approachable verve, Bonfiglio makes an ideal central figure and story teller. He takes us throught Alex’s journey with warmth and clarity, also ably portraying various other characters in Alex’s story, including Alex’s screenwriter boyfriend Barry, various Streisand associates and relatives, and of course, Barbra herself. His portrayal, as Bonfiglio clearly outlines at the beginning of the play, is not a direct impression of Streisand, but it’s vividly effective, portraying an underlying toughness as well as vulnerability in the superstar. Most of the time, though, Bonfiglio is Alex, and as he tells his story and acts it out, the sense of alternating wonder, suspense, surprise, awe, and disappointment is readily apparent. It’s a superb and extremely approachable performance. The technical elements of this play also integrate seamlessly into the telling of Alex’s story. Scenic designer Rob Lippert has created a “blank canvas” type set, all in white, on which Bonfiglio can paint the portrait of his experience. Through excellent use of projections, Tyler Duenow’s colorful lighting, and sound designer Justin Been’s evocative sound effects, the humor and drama of the story is wonderfully augmented. Director Gary F. Bell also designed the costumes, outfitting Bonfiglio in a comfortable, versatile ensemble that suits his character well. This play is an excellent showcase for Bonfiglio as well as an insightful portrayal of the plight of an actor who wants to work, as well as the perks and insecurities of being a world-famous superstar like Streisand. Although this is not a true story, there’s a lot of truth in it nonetheless. That truth is on vibrant, hilarious display currently in this remarkable production at Stray Dog Theatre. Buyer & Cellar is being presented by Stray Dog Theatre at the Tower Grove Abbey until December 17, 2016. Apparently, Barbra Streisand’s basement isn’t just a basement. It’s a shopping mall. She even wrote a whole book about it, called My Passion For Design. That much is true. 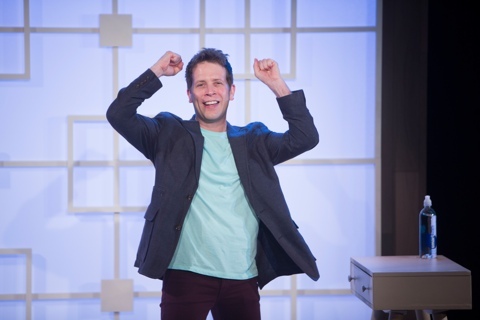 The rest of the story, as presented in playwright Jonathan Tolins’s one-man play Buyer & Cellar, is a hilarious, frantic fantasy. Currently being presented at the Rep’s Studio, this unforgettable production is a brilliant showcase for its star, actor Jeremy Webb. It’s also surprisingly successful at being both a celebration and a critique of Streisand herself, with no dull moments in its roughly 90 minute running time. After a short, comical disclaimer in which Webb, as himself, explains that the story we are about to see is fictional and he’s not exactly going to be doing a Streisand impression, the story gets going, and what a story it is! It tells the tale of Alex More, an out of work actor who has just been fired from Disneyland after a somewhat questionable incident in Toon Town. While looking for a new gig, he’s told of an unusual job at a palatial estate in Malibu, which he eventually finds out is owned by Barbra Streisand. The job is to serve as the sole employee of her elaborate basement mall, maintaining the merchandise and being there to cater to its sole customer, Streisand herself, whenever she deigns to make an appearance. Eventually, of course, she does, and an unlikely relationship develops between the young, initially somewhat clueless actor and the vain but charming Streisand. Through the course of the story, Webb plays a few other characters as well, including Streisand’s husband James Brolin, her somewhat haughty assistant Sharon–who is the one who hires Alex–and Alex’s movie buff boyfriend Barry, who knows a lot more about Streisand than Alex does at first, but then grows jealous of the gradually increasing bond between Alex and the superstar. The story explores a lot of issues, from the nature of celebrity to Streisand’s status as a gay cultural icon, to celebrity hero-worship and indulgence, to the difference between authenticity and artificiality. It’s all done in a seemingly free-flowing way that ultimately follows a fairly well-structured arc. Set on a fairly neutral but vaguely 60’s-influenced backdrop designed by Steve Teneyck, who also designed the striking lighting, the centerpiece of this production is the dynamic performance of its sole actor. Webb is full of energy as he jumps, hops, skips, runs and near-flies from role to role. His Alex is a charismatic bundle of energy and charm, and he accomplishes the amazing feat of building a realistic relationship twice over, as represented in his portrayals of Streisand and of Alex’s boyfriend Barry. Webb’s Streisand is, as he had announced, not an imitation but rather a re-imagining that brings to mind Martin Short more than Babs herself. It works surprisingly well, because the audience is able to get past the distraction of judging the authenticity of an impersonation, instead being enabled to actually view Streisand as a character in the story rather than merely an impression. With Barry, Webb portrays a cynical fan who also clearly loves Alex, and he manages to achieve the strange feat of actually displaying romantic chemistry between two characters both played by himself. Webb is a marvel of controlled hyperactivity and surprising sympathy in the same performance. It’s a wonder to behold, as well as uproariously funny. This is one of the most bizarre plays I’ve seen, and it’s a joy. I didn’t know exactly what to expect when I walked into the Rep Studio the evening I saw this, and what I got was a pure treat. It’s a performance that is full of wit, style and substance, and it’s never, ever boring. Even if, like Alex at first, you don’t know a whole lot about Barbra Streisand, this is worth seeing. You’ll learn a lot and you’ll probably laugh even more. It’s a must-see, and must-laugh, production.